It seems like there's alot of confusion surrounding CAMPs and in general the whole building system. I've got a little bit of experience and I'd like to walk you through what I've found to be universal truths throughout Appalacia. 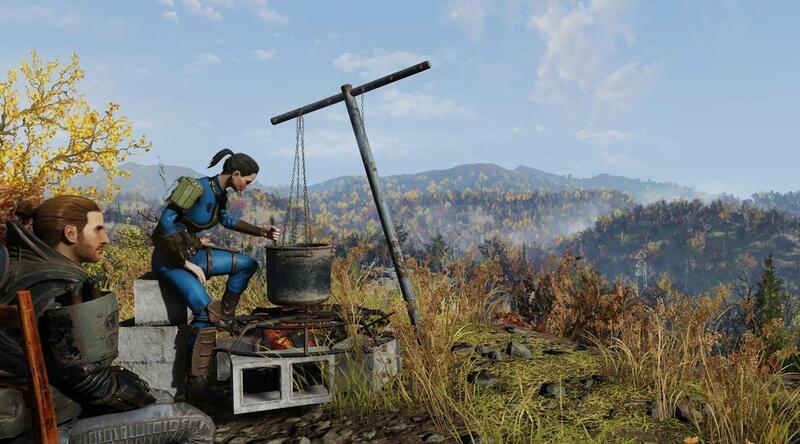 CAMPs are your personal building site and they allow you to build just about anywhere you please in Appalachia. When deployed, you can build items, furniture, crops, workstations and more easily! While I mentioned you can place CAMPs anywhere, you really can't. You can't place them next to existing structures, other player CAMPs, Public Workshops and plainly there's just places you shouldn't put it - like on mountain tops or areas that aren't flat. In order to actually place your CAMP, open up your Pip-Boy (TAB) then hit (Z). This will give you an outline of the CAMP, and it's radius. When it's green, hit (E) to place. After you've placed your camp, hit (E) while looking at your deployed CAMP or hold (V) in order to open build mode. Moving your CAMP is easy as well! Simply move away from your existing CAMP, open up your Pip-Boy, hit (TAB) and then (Z) . This will again give you the green outline! Place crafting stations in your base so you can easily repair, build or cook items needed for your next adventure. Place a stash so you're able to store items for later! Place crops in your CAMP to grow food for use/trade/crafting. Your CAMP has a budget. The budget is displayed in the top right hand corner of the screen. Once you've reached your budget, you're no longer able to build anything new in your CAMP. In order to manage your CAMPs budget effectively, you'll need to understand that higher tiered items and large items cost more of your budget. Small items like signage, take up far less of the budget. Defense structures such as turrets take up large chunks of budget! A good rule of thumb is - if it costs a lot of components to create, you can bet it'll take up a chunk of your budget. When building a CAMP, remember that it's quality not quantity. Storing made simple! Select the item you want stored, then hit (R) to store it within your CAMP. When you open up your CAMP menu, one of the last categories on the left-hand side is "Stored". This is where those items go! You can place them back down whenever you like - at no resource cost. Storing items in your CAMP does still eat up your budget! Blueprints are a great function that allow you to highlight a selection, and store it as a whole. That hut your just built? You can Blueprint it, then stash it away and use it at another CAMP site! Open up the CAMP Menu, and hold (E) this will allow you to select items you want to include in the blueprint. Once done, hold (E) and you'll see it saved in the "Blueprints" section of your CAMP menu. You'll now be able to place this down again when you move CAMP! Blueprints can also be scrapped! Hover over the blueprint and hit (R) to scrap it and make room for another! Build next to material deposits you find out in the wasteland. There's material deposits found throughout the entire map - use them to your advantage! Build on the borders of the different regions - this makes sure you always have a quick escape or safe haven when you need it! CAMP along roadsides and commonly used paths to get other players to come visit. Having a party isn't just a barrel of laughs - in Appalachia it's incredibly useful! Your party can build in your CAMP, making things you don't yet have plans for. Not only that, but when you party up with other players you get a free ticket to fast travel to their CAMP and that players current location. Use this info to spread your CAMPs throughout the wasteland for easy fast travel between regions or to traverse long distances without spending caps. Plans are consumable items found throughout Appalachia. Once you pick once up, you need to use it from your inventory. Plans and recipes can be found under Notes and you can learn them with (SPACE). Once you've acquired a plan and learned it, you'll be able to build it in your CAMP and public workshops. Certain plans contain items sets - such as lettering, signage, chairs or styles. Your CAMP stays on the world (server) for as long as you do. When you log off - so does your CAMP. When you log back in and the area is clear your CAMP will set up automatically. If there's another persons CAMP already there when you spawn in - You'll be able to put your CAMP anywhere on the map for free and all of your items will be in the "Stored" tab.